Skating with Santa: This can, and will, happen. The Sculpture Garden's ice rink is going to face some competition this season -- the Georgetown waterfront's long-awaited rink is scheduled to open later this month. The rink will take over the Washington Harbour fountain, which opened earlier this year as part of a $22.5 million renovation project following flooding in April 2011. The fountain began its inaugural switchover to the ice rink on Oct. 1. Though work was suspended for two days due to Sandy, the rink is still set to open the weekend before Thanksgiving. At 11,800 square feet, the Harbour's ice rink will be larger than both the Rockefeller Center rink in New York City and the National Gallery of Art’s Sculpture Garden rink. 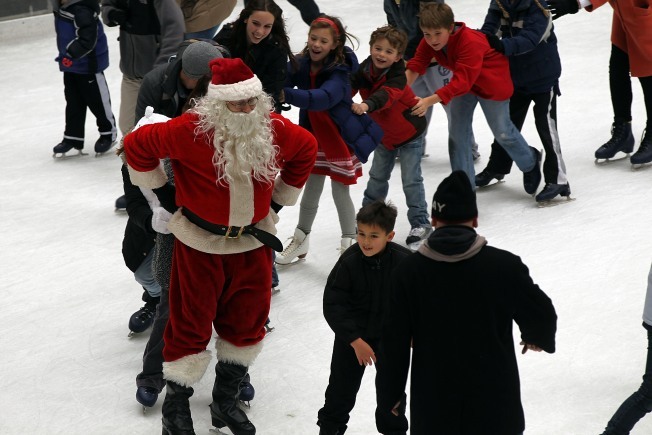 The Harbour's rink will offer open skating, lessons, college student discounts and skating with Santa Claus. The rink will also accommodate parties, special events, birthdays, family gatherings and corporate events. Hours of operation for the rink are noon to 9 p.m. Monday through Thursday; noon to 10 p.m. Friday; 10 a.m. to 10 p.m. Saturday, and 10 a.m. to 7 p.m. Sunday. Admission is $9 for adults and $7 for children, seniors and military members. Skate rental is $5. The rink will be open until March 1, 2013, when it will be transformed back into a fountain. Robert J. Murphy of MRP Realty told the Washington Post last year that the company hopes to draw more holiday shoppers away from M Street, helping Washington Harbour restaurants stay open longer.